Cow colostrum benefits and rebuilds the human body at a deep level. To understand how bovine colostrum benefits your health, you have to first understand what it is and what it's composed of. 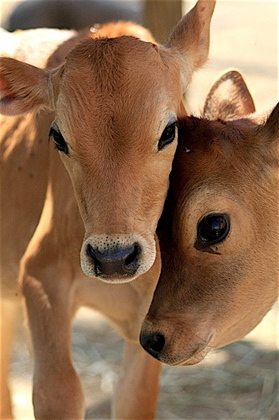 All mammalian mothers produce colostrum milk for a short period of time after they've given birth. This "first milk" is available for a set amount of time (it varies from species to species) after the mother has given birth and then her milk transitions over to regular milk, which is produced for the rest of the suckling stage of her offspring. Colostrum is vastly different in it's nutritional composition than regular milk and this is what makes it one of the most powerful and rejuvenative antiaging foods available. When the Australian Olympic swim team won more gold medals than the Chinese in both 2000 and 2004, they attributed it in part due to their us of colostrum supplements. It is popular among athletes as the health benefits of colostrum milk include decreasing recovery time, increasing strength and performance gains and preventing sickness due to overtraining (a common phenomenon among peak performers). This makes raw colostrum both a powerful yin jing tonic and a live superfood! Naturally occurring lGF-1 (which stands for insulin-like growth factor 1) could be considered the crown jewel as to why cow colostrum benefits human longevity potential so well. According to wikipedia, "IGF-1 is one of the most potent natural activators of the AKT signaling pathway, a stimulator of cell growth and proliferation, and a potent inhibitor of programmed cell death" (this helps combat the metabolic effects of aging). IGF-1 is one of the many growth factors found in bovine colostrum that helps create a state of anabolism in the body which can lead to increased lean muscle mass, bone density and tissue regeneration. The oligosaccharides that are present in colostrum benefits the healing of the skin externally in the form of reversing wrinkles (SurThrival's organic colostrum powder can be mixed with a bit of fresh spring water in your palm and applied as a mask that you leave on overnight for skin rejuvenation) and internally in the form of healing the lining of the digestive tract. These long chain sugars also serve as a prebiotic and feed good bacteria in the intestine (including acidophilus) and aid in the maintenance of peak health for the digestive system. 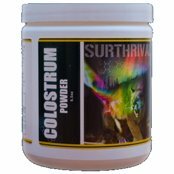 You can get great deals on SurThrival's cow colostrum powder (the best colostrum available, in Zak's opinion) by clicking here! Lactoperoxidase is an enzyme that acts as an anti-microbial agent. 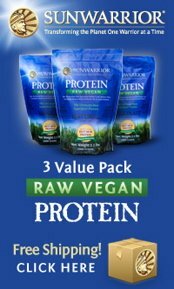 It is found naturally in milk and colostrum to prevent the proliferation of bad bacteria. These beneficial properties are then transferred over to those who consume it. Colostrum benefits your oral health if you let is dissolve in your mouth around your gums. This can prevent or even treat gingivitis and may be able to help re-grow a receding gum-line. Lactoperoxidase has also been shown to stimulate macrophages (white blood cells) to gobble up cancer cells present in the body. The lactobacillus acidophilus in raw colostrum is a strain of healthy bacteria that is an important part of the human immune system. Many people develop an imbalance of not only their intestinal flora (healthy bacteria) but also the flora on their skin and other bodily orifices (ears, nose throat, mouth etc) over time due to poor diets and the use of medication and specifically antibiotics. Acidophilus taken orally in organic colostrum benefits the flora of the entire body by populating first the gut and then it eventually "overflows" into all other areas of the body. As previously mentioned, there are naturally occurring prebiotics in organic colostrum that feed acidophilus as well as any strains of good bacteria already present in your body. Lactoferrin and hemopexin may be two key nutrients in "leveling the playing field" in terms of the difference of lifespan between men and women. One suspected cause for men living shorter live than women on average throughout the world is that they don't regularly shed their blood the way women do once a month. Iron is a pro-oxidant and the theory is that "rusty" old iron that is floating around the body for too long causes damage that builds up over time. Lactoferrin and hemopexin are known to bind to excess iron and remove it from the body safely. Proline rich peptides (PRP's) act as hormones that regulate the thymus gland and help modulate the immune system (much in the same way as the nutrients mentioned above). Specifically, PRP's promote better functioning of T-lymphocytes, they help produce cytokines, they stimulate the activity of natural killer cells (NK cells) and they stimulate and modulate many other immunological functions. What makes cow colostrum one of the best antiaging foods is that PRP's increase the permeability of blood vessels in the skin, resulting in the improved uptake of nutrients into the skin which results in a healthier and more youthful complexion! Are there any cow colostrum side effects? When people who are lactose intolerant learn about how effectively bovine colostrum benefits human health, they are sad because they think that it will trigger their dairy "allergy". As a matter of fact, most people's intolerance to cow's milk (and other types of milk) is for the most part due to the fact that they have only ever consumed pasteurized dairy. After pasteurization, lactase (the enzyme naturally found in milk that is needed to break down the milk sugar lactose) is destroyed and thus people get indigestion when they drink milk. If you consume truly raw colostrum milk (or fresh) then you will be getting lactase within it to help digest it. On top of that, colostrum benefits the regeneration of your digestive system in a way where many people can eventually consume dairy once again after many years of being "allergic" to it (especially if they make a point to just consume raw dairy from cows, goats and/or sheep). 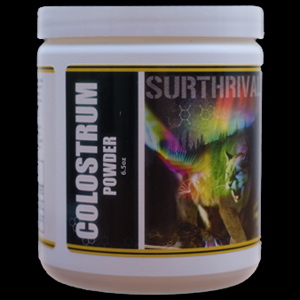 The organic colostrum powder from SurThrival has the added benefit of being taken from a wide number of cows from hundreds of different farms (click this link to get some! ), which makes it help improve your immune system against a wider range of pathogens (the ones all these cows were exposed to in their lifetimes). Fresh colostrum benefits your health in that it would be more "living", but since it is only from a single cow (or single farm) it would be limited in it's range of diseases it has developed an immunity against. 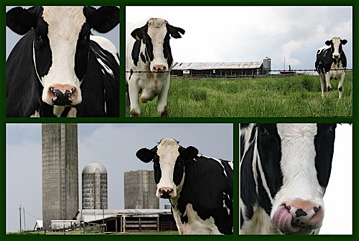 Specifically this article covers the health benefits of bovine colostrum. This is because cow colostrum benefits human health much in the same way as human colostrum because they have nearly the same combination of immune modulators and growth factors (yet bovine colostrum is many hundreds of times more powerful). Also, cow colostrum benefits all types of mammals (great for pets!) as it is not species specific, whereas colostrum from certain other mammals are.